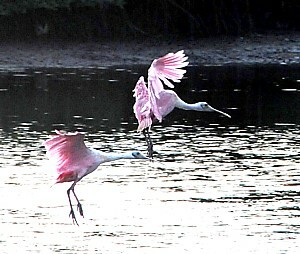 Roseate spoonbills at Ding Darling National Wildlife Refuge, Sanibel Island, Florida © 2012 Karen Rubin/news-photos-features.com. Americans won’t have to look far to celebrate their proud conservation heritage this month. Many national wildlife refuges around the country will host open houses and public celebrations in honor of the 109th birthday of the National Wildlife Refuge System on March 14; hundreds will offer great opportunities for wildlife viewing. On this date in 1903, President Teddy Roosevelt established the first national wildlife refuge on Florida’s Pelican Island to protect wild birds from bounty hunters. Today, the Refuge System’s 556 national wildlife refuges and 38 wetland management districts make up the nation’s premier network of public lands, providing vital habitat for thousands of animal and plant species. Americans reap added benefits in improved human health and recreation, such as fishing, hiking, photography and wildlife watching. Refuges also support local communities, attracting tourist dollars, generating jobs and supplementing the educational programs of many school systems. Last year, 45 million people visited a national wildlife refuge. According to an October 2011 report commissioned by the National Fish and Wildlife Foundation, a nonprofit conservation organization, refuges and other natural lands managed by the U.S. Fish and Wildlife Service generated about $4.2 billion in economic activity and supported more than 32,000 jobs. This free festival includes refuge tram tours, live animals, children’s crafts, music and entertainment. Enjoy live performances at 11:30 a.m. and 1:30 p.m. by Billy B, the Natural Science Song and Dance Man. Hear a talk about wildlife artist Bob Hines at 1 p.m.
Take a free tram tour to celebrate the 28th birthday of the Alligator River National Wildlife Refuge and the 109th birthday of the Refuge System. Learn about the history of the area before the establishment of the refuge. Look for black bear, bald eagles and other wildlife. Join a free naturalist-guided car caravan through the refuge to celebrate the birthday of the Refuge System! Meet at the flagpole. Learn about the history of the Refuge System and of this refuge. Choose from more than 30 free programs a week at the refuge through March. Celebrate the 109th birthday of Pelican Island National Wildlife Refuge and the National Wildlife Refuge System. Enjoy exhibits, wildlife shows, discounted boat tours to Pelican Island, live music and kids’ activities. Learn more about the festival. Celebrate 109th birthday of National Wildlife Refuge System. Meet at refuge office. Refuges are managed by the U.S. Fish and Wildlife Service. Every state has at least one national wildlife refuge. There is a national wildlife refuge within an hour’s drive of most major cities. Use the “Find Your Refuge” feature on the Refuge System homepage to see if your local refuge has an event scheduled. VIDEO: Visit National Wildlife Refuges! 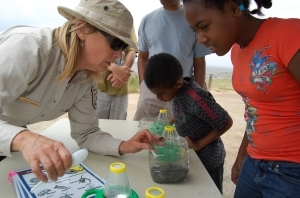 San Diego National Wildlife Refuge manager Jill Terp helps children explore nature at a public event at the refuge. Many refuges will hold open houses to celebrate the Refuge System's 108th birthday on March 14 (photo credit: USFWS). Scores of national wildlife refuges will be holding open houses and other special events to celebrate the Refuge System’s 108th birthday on March 14, 2011. On March 14, 1903, President Teddy Roosevelt established the first national wildlife refuge on Florida’s Pelican Island to protect wild birds from bounty hunters. In the proclamation, President Roosevelt said: “Wild beasts and birds are by right not the property merely of the people who are alive today, but the property of unknown generations, whose belongings we have no right to squander.” He would go on to protect 52 more areas as wildlife sanctuaries before leaving office. The President’s America’s Great Outdoors: A Promise to Future Generations, initiative is the result of a national conversation affirming America’s commitment to conserving and connecting with our outdoor heritage. Our national wildlife refuges provide opportunities for families to share time together and Americans to fish, hike, hunt and pass on proud outdoor traditions to our children. Today, the Refuge System’s 553 national wildlife refuges and 38 wetland management districts support at least 700 species of birds, 220 mammals, 250 reptiles and amphibians, more than 1,000 species of fish and countless invertebrates and plants. Just a few examples of refuge celebrations to be held on or around the birthday date follow. To find out if your local refuge has an event scheduled, use the “Find Your Refuge” feature on the Refuge System homepage. Or go to the Visitors tab on the yellow bar at the top of the page, and click on Special Events in the pull-down menu. Click on “Display All Events.” All events are listed chronologically. Attend the Refuge System Birthday Bash! Celebrate the birthday of the National Wildlife Refuge System. See animals close up and enjoy performances by Reptile World. Includes wildlife habitat tram tours and children’s activities and crafts. Learn more about Patuxent Refuge. Celebrate the Refuge System’s birthday by taking part in free family events at the refuge. Take a free two-hour guided “behind the scenes” tour with refuge managers at 10 a.m. or 1 p.m. Advance registration is required. To reserve, call 541-757-7236. Take part in activities on prescribed fire, local wildlife and plants, law enforcement, wildlife photography and historic structures. Learn more about William L. Finley Refuge. An anniversary celebration, called “Walk Where the Wildlife Walks,” emphasizes refuge trails. Take a guided trail walk, try mystery geocaching or test yourself with challenge trail activities. Canoe the refuge’s expanded canoe loop trail. Learn more about Black Bayou Lake Refuge. Enjoy a free tram tour, and learn why it’s important to preserve these and other public lands for generations to come. Learn more about the event. Learn more about Alligator River Refuge. Celebrate the 108th birthday of Pelican Island National Wildlife Refuge and the National Wildlife Refuge System. Enjoy exhibits, wildlife shows, boat tours to Pelican Island, live music and kids’ activities. Learn more about the festival. Learn more about Pelican Island Refuge. In honor of the Refuge System’s birthday and the amazing work and life of Rachel Carson, there will be movies and lectures, crafts and activities, and outdoor fun for the whole family. Learn more about Bear River Refuge. Enjoy exhibits, hikes, nature trails, music, historical narratives, photo ops and more. Learn more about St. Vincent Refuge. Earth Day, April 22, has been set aside since 1970 to celebrate the earth’s richness, recognize its fragility and educate people about protecting the planet. Many refuges will host public events. Many refuges will host public events in June to mark this annual celebration of fishing and boating, sponsored by the Recreational Boating and Fishing Foundation. With so many national wildlife refuges located near one of the nation’s four major flyways, it’s no wonder refuges are favorite bird festival sites. Many festivals occur in April and May to coincide with spring migration and International Migratory Bird Day. Plan ahead. National Wildlife Refuge Week, observed the second week in October, celebrates the important conservation work of America’s 553 national wildlife refuges. There is a National Wildlife Refuge within an hour’s drive of most major U.S. cities. Here is a sampling of upcoming refuge events. For more information ,visit http://www.fws.gov. It is always a good season to visit a national wildlife refuge. Go for a hike. Sight a bird. Restore your sense of wonder. The National Wildlife Refuge System, managed by the U.S. Fish and Wildlife Service, is the world’s premier system of public lands and waters set aside to conserve America’s fish, wildlife and plants. There is a National Wildlife Refuge within an hour’s drive of most major cities. Hike, snowshoe, x-country ski Horicon Refuge for wildlife watching & photography. Learn more about Horicon Refuge. Take a horse-drawn sleigh ride past an elk herd numbering in the thousands. Reservations needed. Buy tickets (adults $18; ages 5-12 $14; under 5 free) at the Jackson Hole and Greater Yellowstone Visitor Center, 532 North Cache Street, several blocks north of Jackson’s Town Square. Visitor Center hours are 9 a.m. to 5 p.m. daily. Sleigh rides last about one hour, including the shuttle ride to and from the sleigh ride site. Accommodations for visitors with disabilities. 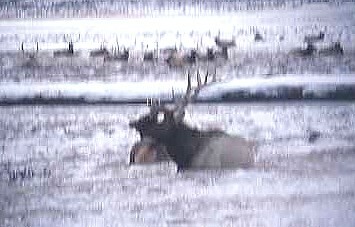 Learn more about National Elk Refuge. Learn about eagles, then take a hayride to an eagle hotspot to see eagles fly in to roost for the evening. Reservations are required. Wear warm, neutral-colored clothing. Bring a thermos or hot mug. Hot chocolate provided. To reserve, call 580-626-4794 or email: fw2_rw_saltplains@fws.gov. Learn more about Salt Plains Refuge. Come out of the cold and enjoy a series of fascinating nature films. The series runs every other Friday until March 18. Learn more about Assabet River Refuge. Take a hike! Make a nature craft! Earn a wildlife badge! Meet other scouts (girl scouts, boy scouts, cub scouts) and have fun. Scout Day is held October through May, usually on the first Saturday of each month. Registration required. To reserve, call 208-467-9278. Learn more about Deer Flat Refuge. Join a refuge ranger for a walk of the refuge and learn about our local wildlife. Some binoculars and wildlife guides are available on loan. Meet in the visitor center at 680 Hudson Road, Sudbury, MA. Learn more about Assabet River Refuge. Talks in the Wild about Life Lecture Series are held October through May, usually on the second Tuesday of the month. Learn more about Deer Flat Refuge. Join a winter hike to discover the history of Parker River and Plum Island. View the last private home on the refuge and learn how the refuge was established to protect habitat for wildlife. Space limited to 10 participants. Meet at refuge Parking Lot 1. Learn more about Parker River Refuge. See event description for Friday, January 7, and Saturday, January 8. Learn more about Salt Plains Refuge. Join small free tours along Grassy Island Wildlife Drive, and enjoy close-up views of two active bald eagle nesting sites. Look out over scenic Reelfoot Lake, where you may see coots, bald eagles and a variety of waterfowl. The tour will also stop at our Long Point unit, where thousands of geese and ducks congregate to feed. Dress warmly. Tours last about two hours. To reserve, call 731-538-2481. Call ahead to request loaner binoculars. Learn more about Reelfoot Refuge. Introduce your homeschooler to the art and science of tracking wildlife. Children, ages 6 to 10, will become wildlife detectives and explore the clues animals leave behind. Program will include both indoor and outdoor activities. Learn more about Parker River Refuge. Celebrate wintering Central Valley migratory birds at the Galt Winter Bird Festival. The festival offers exhibits, workshops and tours to local refuges, including Stone Lakes National Wildlife Refuge. To sign-up for a tour, visit the City of Galt websiteor call 209-366-7115. See event description for Sunday, January 9. Learn more about Assabet River Refuge. Free activities focus on how wildlife and people deal with the snow and cold. Try out snowshoes. Enjoy exhibits, nature crafts, face painting, food, sleigh rides, a bonfire and wildlife presentations. Learn more about Sherburne Refuge. Explore the fascinating world of owls in New England. Hear a talk on owl characteristics and identification of owls in Massachusetts. Then head out on refuge trails to locate some local owls by sight and sound. Bring a headlamp or flashlight. Reserve a space by 4 p.m. Thursday, February 17; only 30 spots available. To register, call 978-562-3527, ext. 115 or 117. Learn more about Assabet River Refuge. See a complete list of refuge activities and special events.